Thermophore Automatic Moist Heat Pack, manufactured by Battle Creek, is specifically designed for the neck, sinus, and temporomandibular joint, commonly known as TMJ, areas. However, you can also use this device on other joints, too, such as your elbows, knees or ankles. This moist heat pack functions by delivering deep heat therapy to sore and painful areas. Featuring a Velcro fastener, you can adjust this heat pack, specifically where you need, for a snug fit. To start receiving moist heat therapy, simply press and hold the special hand-held switch. As a safety feature, the unit will stop producing heat when you release the switch. Recommended by Battle Creek, the suggested application time is 15 to 20 minutes per session. Buy now and start receiving therapeutic treatments today! 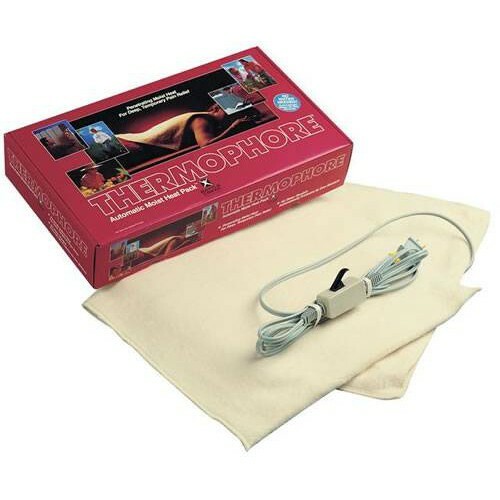 However, if this Thermophore Classic pack does not meet your specific therapeutic needs, make sure to check out some of our other moist heat therapy products, such as this moist heat pack and moist heating pad, here. Heats through a hand-held switch. Moist heat therapy to alleviate pain and discomfort. Velcro fastener to deliver a snug fit. Power: 110 Volts; 44 Watts - 60 Hz. Application: To alleviate pain and discomfort through moist heat therapy. I did not like this pad because I had to keep holding the lever down for it to work. I have another one, with a pause button, but I don't like that either because if you fall asleep before you pause it, it gets so hot you can burn yourself. I had one once from another company, and I think they went out of business, but it had a digital control on it to where you could set the temp. at where you wanted it, and then when it reached that temp. it held it for 1 hr., then cut off. I have been looking all over the place for one like it. It was truly a blessing for me because I have 2 spurs on my spine which grate against a nerve, and when they do, the pain is almost unbearable. 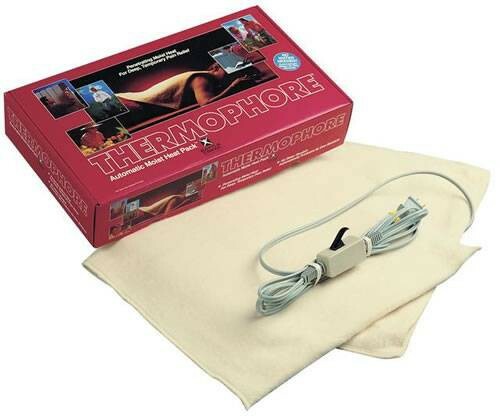 I absolutely love the Thermophore Automatic Moist Heat Pack. I purchased two, one for my friend and one for me. This is my third Heat Pack. Everyone who uses this product knows full well that it accomplishes exactly what is needed - relief for sore backs, hips, necks as well as full-body! Soothing heat with moisture! My Mom loved it so much, could not wait till a new order comes in so she took my old one. I ordered a brand new one for myself!!!! I really love this heating pad. It is very safe to use while preventing you from falling asleep. It heats only if you push a bottom and heat goes off when you let go of the button. Also, it is great for patients with Arthritis and other related diseases. I highly recommend this product to anyone.